Physical Form : Average-sized, stocky, thick legs, round paws, semi-short muzzle, round head. Coat : Dark blue, short, thick and plush, has a sheen to it. Eyes : Large, round and gold. Strengths : Well-muscled & stocky, powerful forelimb strength, decisive. Physical Form : His build is quite lanky and thin, having long, bony legs and large, bat-like ears. Coat : Being a true albino, Fish has a pure white pelt – with any visible skin such as his nose, inner ears and paws being a fleshy pink. His medium-length fur is soft and feathery, it is also quite visibly plumy, splaying out from the base and giving him quite the uncanny resemblance to a dandelion or a newborn chick. His tail looks remarkably like a feather – fluffing considerably at the base then smoothing into a more sleek and organised form as it nears the tip. His build is quite lanky and thin, having long, bony legs and large, bat-like ears. His face is almost always set in a half-lidded, bored-looking expression. Eyes : Large, round eyes donning a quite unusual pinkish-red, right down to the pupils. Other : Being albino, Fish has certain problems that affect his everyday life: He can’t stay out in direct sunlight for too long, his melanin-lacking skin being extra-sensitive to the UV rays, has poor eyesight and has reduced hearing capability in his left ear. Because of this, he hunts mainly via scent and doesn’t leave the confines of the shaded sections of the territory unless it is an overcast day. Vocal Characteristics : Fish speaks almost entirely in fragments - conjunctions such as "and" and "but" are a rarity coming from him. On that same path, he also never uses contractions. His voice always sounds perpetually bored no matter what emotion he's conveying, and carries a slight monotone. Personality : Fish is a quiet, reserved tom with loner tendencies who likes to keep himself private. He has trouble describing feelings, and tends to remain fairly unemotional in the face of danger or distress – unless a major event occurs with much personal pain, in which case he is known to be susceptible to depression. With his inability to describe his emotions comes the inevitable trait of not being very affectionate – in fact, he flusters very easily at contact and affection from others. This albino tom is well-organised, hard-working and great at planning, as well as being dutiful and dependable. He’s focused, with good concentration and is all-around a down-to-earth cat. Fish is also somewhat of a perfectionist, and prefers for everything to be tidy and in order. Not being quite so open-minded, this tom does not like strange things and is quick to form an opinion of them. Fish is also known to be guided by his moods, and tends to make bad choices when filled with intense emotion – part of the reason he usually remains so calm. Physical Form : With his long body and tail, triangular head, large ears and nicely blanaced, muscled form, Fleetpaw shows more of his Somali heritage than his sister - so much, in fact, that you may assume, on first appearance, that he was a purebred. Coat : Long, smooth, light, plumy fur with exaggerated tufts here and there. Fleetpaw's coat is a chocolate mink bicolour, and clearly shows the agouti gene he carries. The white is present on all four of his paws, extending up his legs with the exception of his left paw, where it is only present on two of his toes. His fur looks remarkably similar to his grandfather's, a fact he vehemently dislikes. 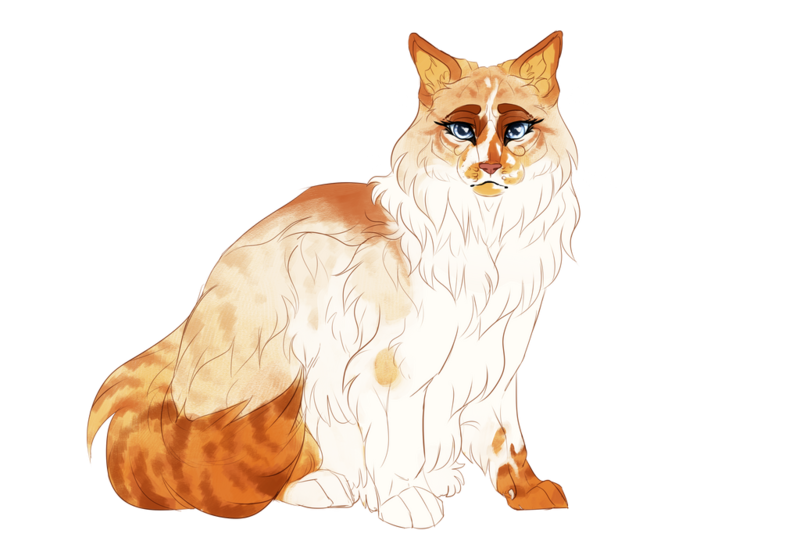 Eyes : Fleetpaw's eyes are almond-shaped, and are wide and expressive. They glint a greenish gold. Quirks : Rambles on excessively in excitement when asked about something he knows, and will explain each any every detail, no matter how simple the question asked. He doesn't mean to show off or parage around his bookish nature, he's just very enthusiastic about the inner workings of everything around them, and enjoys discussing them. Coat : Saffronpaw's red lynx bicolour fur is long, thick and heavy. Her tabby stripes are bold on her points, but fade to near-invisibility on the rest of her pelt. The white on her body covers her neck, chest, forelegs, belly and three of her four paws. They also form a rather broken blaze on her face. Eyes : Her eyes are of more a traditional almond shape than her brother's,k and are an icy periwinkle-blue. 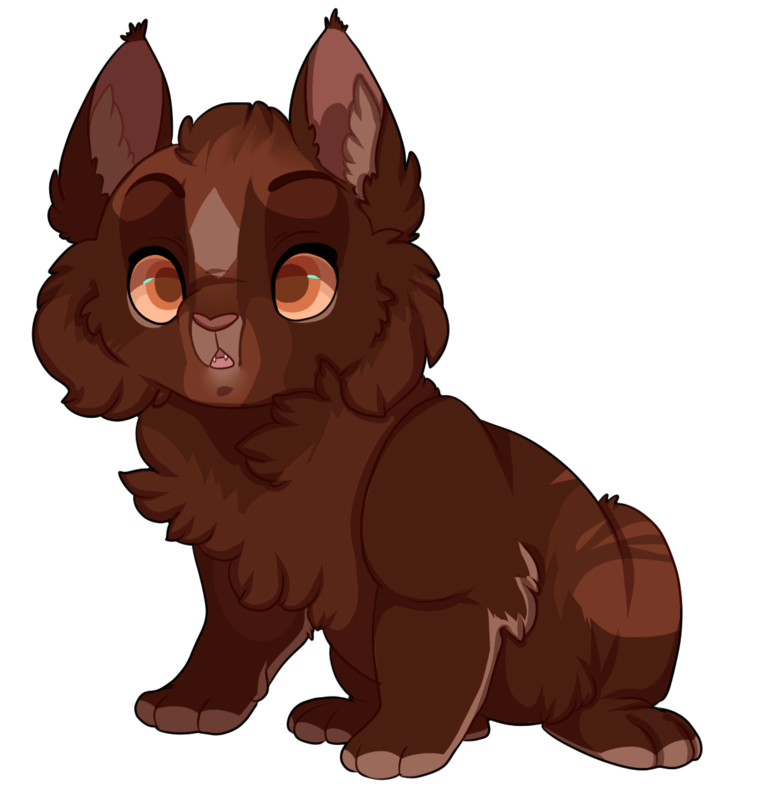 Vocal Characteristics : Saffronpaw's voice is soft and smooth, and often sounds as if she is whispering. 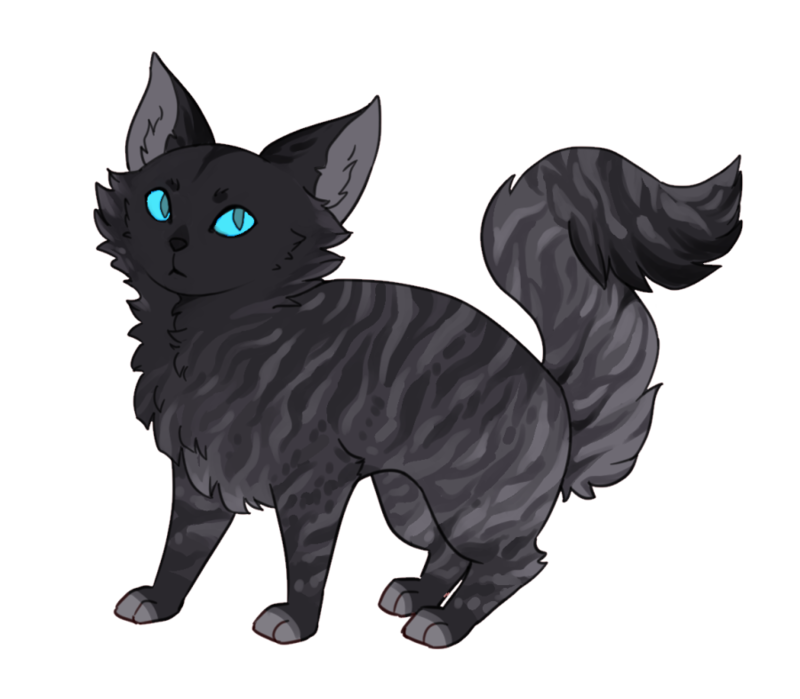 Personality : Calm and collected, Saffronpaw is a cat of proud, regal demeanor, and as such, is very polite to most everyone. Though she does not loathe social interaction, this quiet female prefers to keep way from the other cats to maintain her peace. She lives by the phrase, “silence is golden,” and becomes sullen when her tranquility is disturbed. Complimenting this, Saffronpaw rarely speaks without need, and will only initiate conversation when there's something that she wants, or has something important of note to make others aware of. She doesn't particularly portray her current mood on her face, her expression almost always set in a default neutral, which can make it hard for others to figure out exactly what she thinks or feels about certain issues or the topic of discussion. 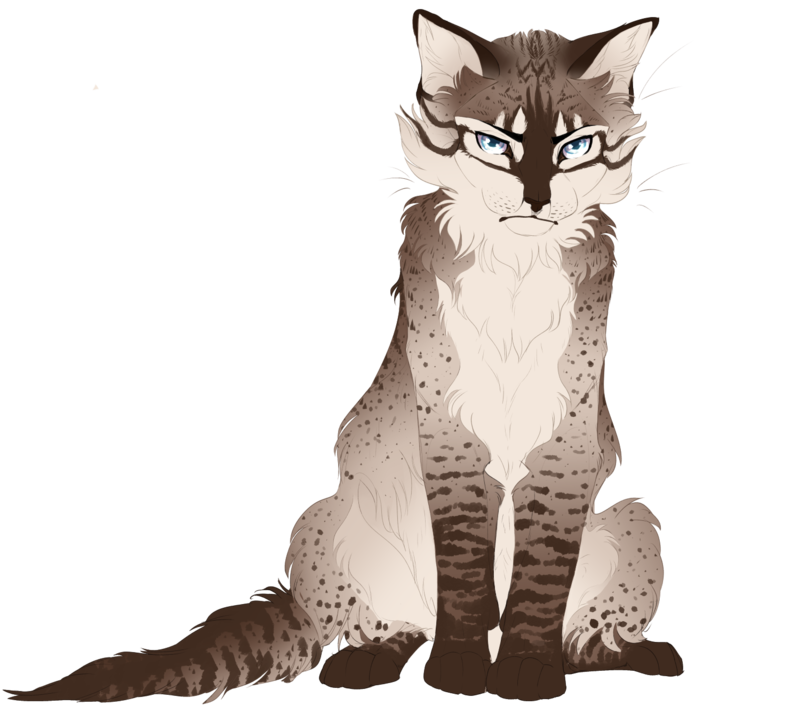 Despite this, though she seems somewhat cold, Saffronpaw is a she-cat with a soft heart; a very empathetic female. Kind and well-mannered, she is rarely ever angry. She is flustered quite easily, and treats others with much respect, no matter how they act towards her. In a display of irony with her being on the larger side for a female, she's not a cat you'd like to bring to battle, as she'd likely just flee. This is partially due to her traumatophobia. Despite that, she could never leave someone she loves if they needed help, no matter how scared she is or how dangerous it might be. Burdened with an eidetic memory, Saffronpaw remembers every moment in her life as if they’d only occurred moments ago; being able to recall in evocatively descriptive detail each second of every day. While this seems like an amazing thing to have, she sees it as nothing more than poison, for while she can relive her most precious memories, it is the events of horror that stick around most vividly. Quirks : Although she now has her freedom, her upbringing still affects her daily life; she still holds herself in a poised manner, moves in a graceful gait and is relatively silent unless spoken to. 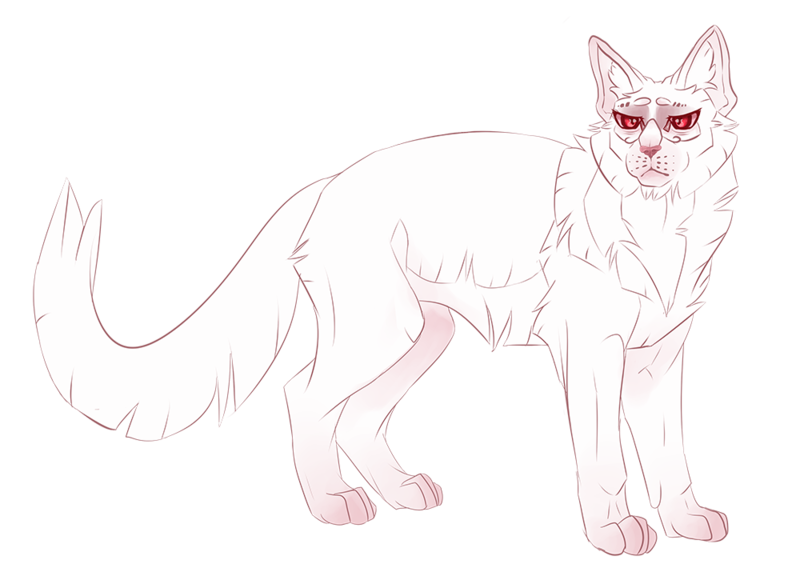 Saffronpaw has traumatophobia, which is the fear of injury or being wounded, both to others and on her own person. She loves flowers, fancy-looking rocks, as well as pretty things in general. Like a crow, she is distracted by anything shiny. 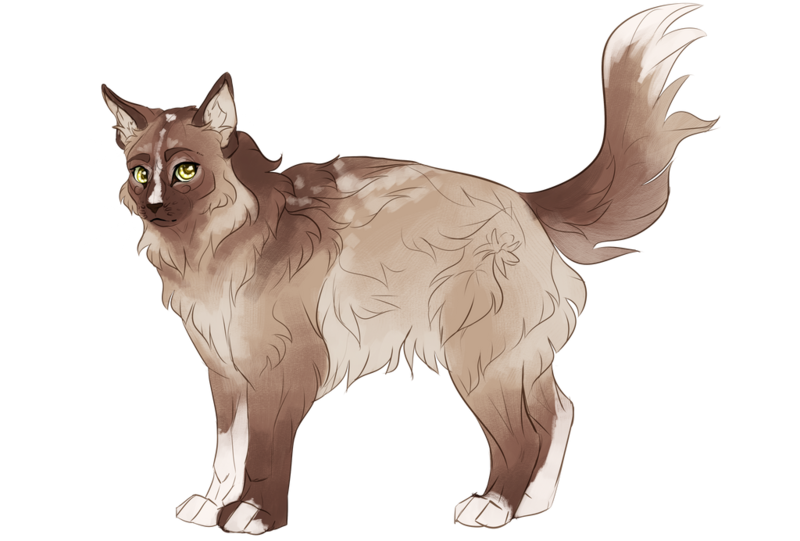 Backstory : Saffronpaw was born as the oldest in a three-kit litter in a small band of outsiders consisting of her granfather, grandmother, three large males and her parents - a ruddy-brown male called Chico and an extremely pale - almost white sandy lynxy point female named Mocha. Unfortunately, Chico was killed by a coyote not long after their birth, and the kits have no memory of their father, and their grandfather took the lead in their raising. 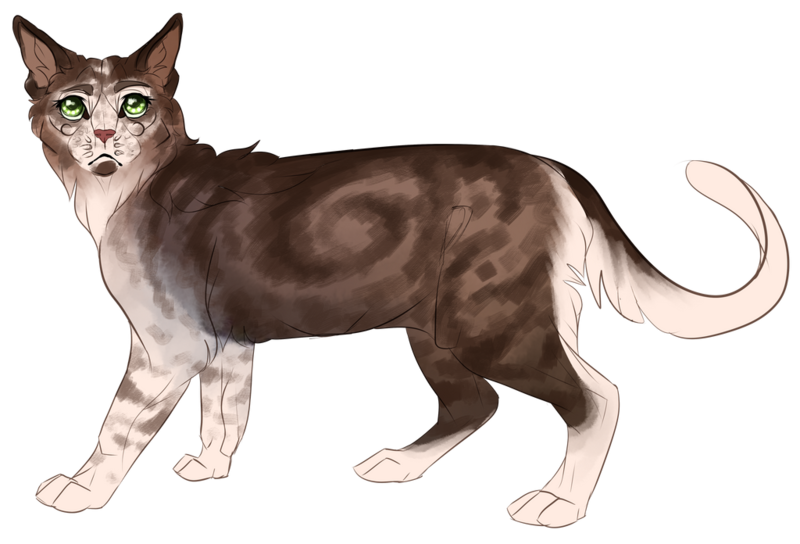 Saffronpaw was raised in an extremely strict and straight-laced male-dominant family. Her posh grandfather idolized and spoiled her brothers, Geode and Fleet, but expected his mate, daughter-in-law and granddaughter to remain silent unless they were spoken to, and if they weren't, they were punished. More than anything, he cared about their image. All members of the family had to hold themselves in a certain way, walk in a certain gait, and generally give off an apparent of importance. 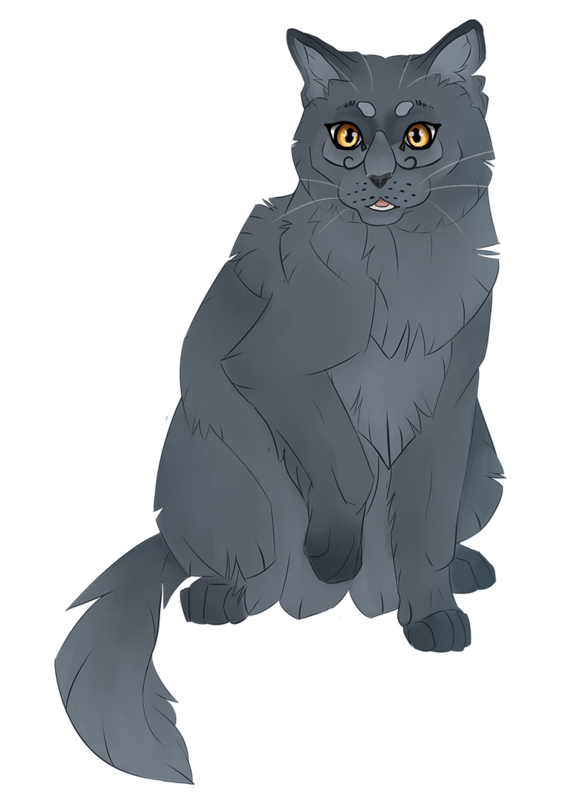 Saffron's kindest brother, a bright-eyed kit called Fleet, more soft-hearted than his grandfather, secretly promised his sister that he'd overthrow their grandfather and make their living conditions better for her when they were adults. Throughout the majority of her kithood, Saffron's only friends were her mother and Fleet, the latter, for a time, would keep his grandfather from being too harsh on the two females. Those few months were the happiest times the young female had ever experienced with her family. However, her breif period of relief couldn't last for long. When the siblings were four months old, the youngest son, and her father's favourite, Geode, passed away. She was not told what happened, but Fleet later told her that he was bitten by a snake. Her gang mourned the loss for moons, but during this period of mourning, her grandfather's harsh treatment, enhanced by the grief that festered in his heart from the loss of his pride and joy, was turned tenfold on Saffron and her mother. Fleet had forced himself to stop mourning before the others, trying to protect his remaining sibling and mother, but not even his living grandson's influence could keep the leader at bay any longer. The bond between Saffron and Mocha slowly nurtured a fierce protectiveness within her mother, which clawed and scraped and wore down her obedience over the coming months until one day, when Saff was little over five months old, her mother could take her father-in-law's egotistic negligence no more, and the next time he scolded her daughter for speaking out of line, snapped. She leaped for the elder male's neck and sunk her teeth into his flesh, shoving him to the ground and shaking him as if he were no more than a piece of prey. The sight horrified Saffronpaw, and she fled, the image of blood standing boldly from her mother's pale coat and white fangs burned into her mind for all eternity. 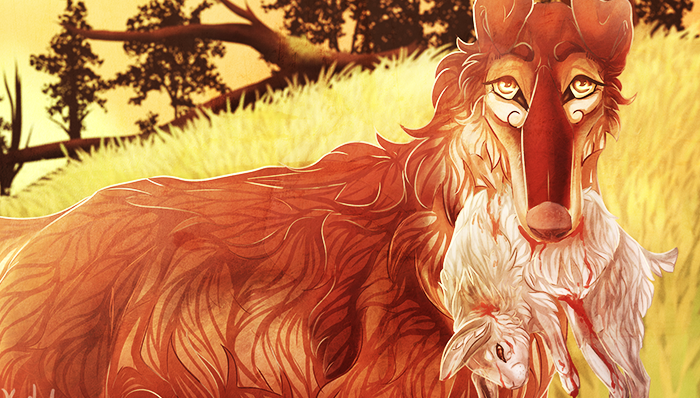 She wandered on her own for a month until Fleet found her, pleading that she return home with him. She refused to, in fear of her mother, and sorrowfully made the decision to leave the old territory. It was only a few days later, however, that Fleet returned and announced that he would come with her, and so he did. The siblings made their way around an unknown land, keeping to the bushes and the more densely-foilaged areas of forest as to hopefully avoid large predators, such as wolves, before an old she-cat named Buzzardsong, caught them stealing a thrush she'd hunted. After chasing down and talking to the kits, she brought them back to the clan. Coat : Brown classic tabby with bicolour. Her dark fur is losing its pigment with age, most noticable on her face, chest and forelimbs. Her fur is short and coarse, but softens towards her belly. Coat : Lemonwhisper is a long-furred, fluffy, chocolate mink she-cat with a white chest, her left forepaw is also white, her fur darkens on her face, ears and the tip of her tail. Eyes : Her eyes are an ice-blue. Coat : Cinnamon Chimera with a thick, woolly coat and puffy head fur that sleeks backwards. Meaning of Name : Cocoa, after her domestic name, and leaf from the tree cocoa comes from to signify joining MistClan. Coat : Marbled tabby - Charcoal seal mink. Cocoaleaf's fur is sleek, shiny, and smooth. Meaning of Name : Merry, after her demeanour as a kit, and tree after the hangout she's often found in.